Get a tan right through your shirt or swimsuit! Why not go for that all-over suntan through the most comfortable swimsuits and shirts in the world! That's why we created COOLTAN Tan-Through Swimwear and Sport Shirts that are available in styles for both men and women. At the beach, boating, on vacation, or just relaxing in your yard, a COOLTAN tan-through swimsuit and shirt lets you get a natural suntan through the fabric... fast and easy. And 100% cool and comfortable! 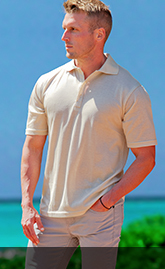 The secret is Microsol®, a unique lightweight, high quality, and attractive fabric that lets sunlight through your shirt and swimsuit like a medium level sunscreen. Eliminating the need for messy tanning lotions and sprays. You'll get a tan about as fast as you would with a medium SPF sunscreen, and it's as easy as walking along the beach. The lightweight Microsol fabric also keeps you cool and comfortable! Air and water flow right through the fabric, so you'll stay cooler and drier even on hot summer days. COOLTAN Tan-Through swimsuits and sport shirts are perfect for vacations! All tan through suits and shirts are fully machine washable and just hang to dry. If you need a different size or color, we make it easy for you... just send it back for an exchange or refund, whichever you prefer.